Singapore Drum Shop is pleased to be an exclusive Sonor Distributor in Singapore. SQ2: The SQ² Drum System represents SONOR's extensive know-how in drum making and sound design. Building upon more than 140 years of manufacturing experience this range of custom instruments offers the ultimate in SONOR craftsmanship. It is the flagship within the SONOR Drum program. With an almost unlimited variety of shell - size - finish combinations SQ² is the most individual Drum we have ever made in our history and the most unique one you have ever dreamed of playing. It will let you speak with your personal musical voice. It is your signature in sound. One Of A Kind: One Of A Kind... that's what you get with one of these handbuilt masterpieces. The stunning natural grown veneers make each snare drum as unique as your fingerprint. Sonor selects a certain tree for each edition, then Sonor's master builders shape the veneers into form - not only on the outside but also on the inside of the shell! The extensive highgloss lacquering method brings depth to the precious wooden surface - a SONOR hallmark. For the first time Sonor uses hybrid shells made from maple and birch or maple and beech which bring a sonical addition to the past issues of "one of a kind" drums. The instrument badges highlight the laser cut iconic mallet logo, made out of the same veneer that is used on the snares itself. In taking care about of our environment, all veneers come from certified and resource-saving trade partners of the company. Get your one out of ninety-nine collector's item now. Building upon more than 140 years of manufacturing experience, the SQ2 range of custom instruments offers the ultimate in SONOR craftsmanship. It is the flagship within the SONOR Drum program. You can contact us for more custom options. These snares represent the finest German craftsmanship that SONOR has to offer. Each drum comes with an exclusive Hardcase with certificate and custom gold key and lanyard. Sonor introduces the SQ1 series, a new dimension in sound. Birch shells in combination with new innovative Sound Sustainer technology form the basis of a drum series with extraordinary sound characteristics. Together with exclusive matte lacquer finishes, a professional drum concept for live performance and studio recording was developed. Photo listed is a 14x5 Snare. Vintage series drums feature hand‐selected premium German Beech shells with rounded bearing edges. We have carefully recreated the look and feel of the 1950's teardrop lug and updated it with SONOR's exclusive Tunesafe™ system. Being sure not to overlook any details, SONOR has redesigned the Superprofil triple flanged hoops and brought back the timeless SONOR badge and logo used in between 1952 and 1961. Artist Series: The exclusive SONOR Artist Snare series combines the experience of the world’s most talented drummers with SONOR’s vast percussion instrument manufacturing expertise. This partnership has produced unparalleled snare drum models which meet even the most stringent demands. Since 2004, drumming scene’s shooting star Benny Greb is part of the SONOR family. Says Benny: "For me as an artist it is key to embrace both tradition and innovation, and the guys at the SONOR Drum company do that same thing. I feel close to people that love what they do and who are dedicated to quality. That’s why I feel close to the SONOR Company." Benny can be found playing with an assortment of musicians, all demanding his tasteful and immaculate playing style. You will find him in rock settings, laying down a ferocious backbeat with both Stoppok and The Ron Spielman Trio, in jazz with the aptly titled Benny Greb Brass Band. Early 2010, SONOR and Benny begun working on a very special Snare Drum, Benny’s very own Signature model that is as versatile and musical as Benny himself. Benny favors Beech, and that’s what gives the Drum its transparency, warmth and a wide tuning range with a fat sound. The beautiful outer veneer is Scandinavian Birch that adds a timeless look to the Drum. But it wouldn’t be Benny without adding something very special. The personalized Benny Greb badge shows his unique "Cartoon-head", and a synthetic design ring is being applied to the shell. In late 2011, SONOR and Gavin began working on the “Protean” project with the goal to create a snare drum that is as musically versatile as Gavin himself. The name “Protean” comes from Greek mythology meaning “versatile” and “diverse”. Gavin wanted this snare drum to be a daily workhorse instrument that can be quickly altered to suit the musical situation. “When I had the chance to design this Snare Drum together with SONOR I knew exactly what I wanted to achieve because it is based on my experience of the last 30 years playing professionally. I chose the shell material, the hybrid bearing edges, the dampening rings, the S-Hoop and the 8-strand snare wires because I know they work in all sorts of different situations. We called the drum ‘Protean’ because it’s versatile and you can change the features very quickly to get a sound that will be musically right. I wanted the look of the drum to be able to fit in with any drum set. It has a sleek Art Deco look about it with a classic black satin finish. With its thin Vintage Maple shell, this Artist Snare Drum offers excellent resonance and a clear, transparent sound. The classic Scandinavian Birch finish and the 24k gold-plated fittings give it a very high end look. Its warm and rich sound make this snare drum quite versatile and naturally suited to a wide variety of musical styles. 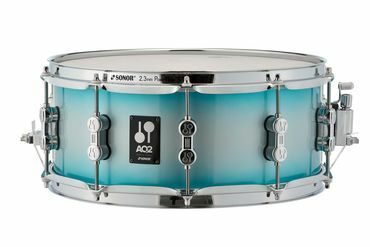 Sonor AQ2 Snare Drums offers the best value for its price point. Designed in Germany, the Maple Snare Drum features a hybrid shell of Canadian Maple and Chinese Maple. Featured with Die Cast Lugs, Power Hoops, Remo Heads and a choice of Gloss Lacquer and Wrap Finishes. These Snare Drums sound similar to drums double its price with a great brand heritage. Great for drummers looking for their "first Snare Drum" or for professionals on a budget. Check out this video of Emmanuelle Caplette playing the 14x6 Maple Snare and 12x5 Steel Side Snare.